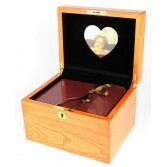 The Cremation Urns Company offers a beautiful range of wooden ashes caskets made in the true spirit of the artisan craftsmen. This type of work is time consuming and detailed, and combines many joinery and cabinet makers skills with the best timber materials, resulting in the finest wooden ashes caskets available. Our caskets are made of either oak, mahogany, ash or pine and are embellished with details such as moulding and inlay work and finished with a luxurious lacquer or polish. 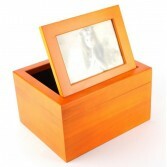 Wooden ashes caskets have the advantage of being both bio-degradable and suitable for display and as they are made from wood they have a comforting warm tactile feel you just don't get from other materials.